Science experiment. Yeah that about sums it up! As you say it's the moisture vapor that is the unknown factor. One would think that tile/thinset/RedGard/DensShield would prevent moisture behind the wall but I ain't no scientist. Thanks for the advice Dave! Time to fix your problems would have been when you framed in the shower walls and that's still where I'm gonna recommend you start, even though it'll require that you remove, or at least replace, your existing floor. 1. If it was your plan to use the RedGard for your shower receptor and walls, I don't understand the use of DensShield as your backing material. 2. Appears to be a Schluter drain grate on the floor. Did you actually install a Schluter drain in that depression you had in the concrete floor? 3. Your shower is curbless, yes? The problem you'll have now in adding more DensShield over what you've currently got is that there is no acceptable way to seal the bottom of the wall panels without removing the floor tiles and re-waterproofing the whole shower again as you did the first time. I suppose you could install a CBU over what we see in your photos and cover that with RedGard, but I'd still not be real comfortable with that as you have no way to attach the new wallboards near the bottom without puncturing the existing waterproofing membrane you have. I'm not in favor of two waterproofing layers that close together as you're suggesting, 'specially with raw wood between them, but that's all entirely up to you, of course. [Edit] I didn't see DaveG's comment when I posted, but now it appears we're two for two against. Last edited by cx; 12-02-2017 at 10:27 AM. Good to be back Kelly! Agreed. The floor ain't going anywhere. We added an addition to the existing house and the contractor created the presloped concrete floor for the shower into the foundation. I'm using RedGard as an extra moisture preventative over the DensShield. Earlier this year, Custom Building Products told me over the phone that I should not RedGard over DensShield except for seams and nail/screw holes. However, the DensShield Question and Answer PDF does say "Prior to the tile installation it is permissible to apply a fluid applied membrane to the face of DensShield Tile Backer for enhanced moisture resistance." So, for me, RedGard is simply an extra insurance "policy" against moisture issues. No Schluter drain. Contractor's helper messed up the drain a bit when they laid the concrete. So rather than redoing it, I laid the floor tile around the drain hole and then cemented the drain grate into the cement floor (see pic below). Well, I did RedGard everything -- floor (which is cement), ceiling and walls. So, everything as it stands now is waterproofed. My concern--and this I believe is what you are saying--is how to seal the space between the two DensShield layers. I could use silicone to carefully seal any/all gaps at the top, sides, and bottom, but that would require the silicone actually close any/all existing gaps. No sure way of telling if I'm successful. Any holes/gaps would potentially allow water vapor between the DensShield layers. And of course I'd have to make sure to wipe off excess silicone so that further RedGarding would stick where I'd need it to stick. Raw wood as well as cardboard shims. I'm not too thrilled about it either. The ceiling and shower wall are fairly level and square. The other two opposing walls are the buggers that I may need to tear out and redo. I'd probably sawzall the screws off from the DensShield and leave them in the studs. And then I'm not sure how many more screws the studs could take before being compromised. That's one more reason that I'm contemplating adding another layer of DensShield over the 1st layer. (Edit: Duh...I could just add more studs!) Decisions, decisions! Last edited by SemiDriven; 12-02-2017 at 11:49 AM. My wife had a suggestion. Rip off the DensShield on the two opposing walls, add needed studs, shims, etc., to get the walls square and straight, put DenShield back on, and then tile over the existing floor tile. This would solve my bottom seam/joint issue. Since the floor tile is already down, I would RedGard the bottom seam area, apply a self-adhesive 2" wide fiberglass mesh tape over a portion of the wall as well as the existing tile, and then add thinset. Then after the walls and ceiling were tiled, I could come back and put the floor tile in over the existing floor tile. Anyone see any obvious red flags in this plan? However, by going this route, I'd have to deal with the drain again (see previous post and pic). Perhaps I could get away with cementing another drain grate over the existing one. Perhaps not. Using Fiberglass mesh tape to seal joints always necessary? Assuming one has attached DensShield, CBU, etc., correctly to studs, will any wall movement occur due to the added weight of the tiles? The reason I ask, is I’m wondering if the self-adhesive 2” wide fiberglass mesh tape used to seal joints is necessary—specifically at the bottom of the shower area. Since I’ve already got my floor laid, redoing the walls will bring the DensShield within an 1/8” to the tile. The DensShield would be resting directly on the concrete sloped shower “pan” (baked into the foundation of the new edition). If I skip the fiberglass mesh tape and simply insert multiple thin coats of RedGard in that narrow area as a moisture barrier, I’m concerned that any slight movement in the wall would open up a hairline crack/hole in the RedGard allowing moisture vapor behind the wall. I’m guessing that the fiberglass tape helps to stabilize any possible movement as well as helping silicone/RedGard/thinset adhere better to the joint area. By skipping the fiberglass tape, I could theoretically keep the existing tile in place. I’m assuming the pros here always use the fiberglass tape for sealing joints. If that’s true, then it looks like I will be tiling over the existing tile in order to get a good seal at the base of walls. Just want to get a clearer picture of what the end-game is going to look like down the road before I start redoing the walls. Wasn't as tough as I thought it would be. I'm really impressed with that RedGard stuff--that's some strong material! Welcome any wisdom regarding the last few posts! The issue with your questions is that you're moving into the area of maybes...will your fix work? Maybe. Its hard to advise people on fixes like this because there is no real proven method. Trying to tie your wall and pan together now that you've removed the wall will be a big maybe no matter how you try to do it. Obviously attempting to avoid the darker side of "maybe!" Well crap. After blowing out the walls last week, I discovered that my contractor put plastic behind the DensShield on the ceiling. Above the plastic I’ve got 12-16” of blown in insulation. So, removing the DensShield and plastic will result in an avalanche of insulation. Hmmm…. I’m now thinking that I may have to consider putting in a Schluter system from top-to-bottom as it will prevent moisture from getting behind a CBU board...as long as it is installed correctly. I’m not at all sure a Kurdi drain will work considering what I’ve done so far (see pics below). If I put Kerdi over the existing tile on the floor, will I be able to install a Kurdi drain? I might have to call in a professional to assess the drain situation before proceeding further. It looks like you'll need to cut some concrete and pipe to get a kerdi drain to work. So why is the plastic behind the ceiling DensShield a problem? Get a demo hammer / chisel and remove your floor tile. Get a grinder with a diamond sanding/buffing disc and clear the RG and any other residue off of the concrete. 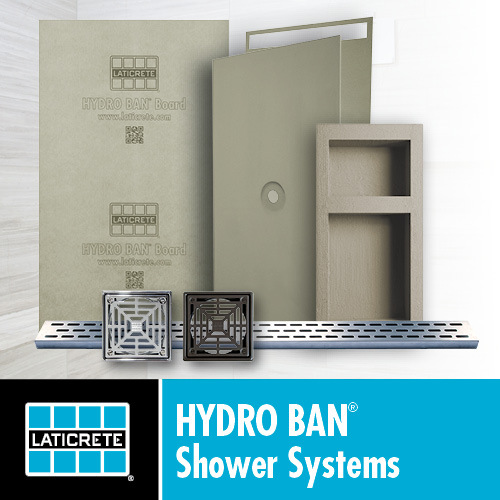 How are your walls tied into the shower pan re: waterproofing? 3) Either put in new denseshield or cement backer board (denseshield will be easier because it will seamlessly match thickness of the rest of the walls it joins into). 4) Research a membrane (Kerdi/USG/etc) product to cover the floor pan and connect to your new drain. Wrap that product a bit up the wall if Denseshield and then RG the rest of the wall if you want, or if using cement board, either RG the rest or cover with fabric membrane, same as the pan. Right now, today, will be the EASIEST and BEST time to start over. Trust me, you'll save yourself a ton of worrying, research, questions, and the inevitable sinking feeling in your stomach when this goes sideways after you've got the money and time into trying to patchwork finish this. You put another $1k of tile, $100 of grout, and two more weeks of your time into this thing and then have to tear it out, you'll be a lot more angry than the current cost of a $60 tub of redgard, $100 of floor tile and some sweat equity to start over. The question is how much concrete and pipe? I will most likely need to contract this out. Thanks Ryan for the advice! Last edited by SemiDriven; 12-10-2017 at 03:11 PM. Wayne, the manufacturer says NOT to put a moisture barrier (such as plastic) behind DensShield. So if I ignore the recommendation of the manufacturer (as well as a lot of pros on this forum), I'm looking at a potential headache down the road. Because I can't realistically take the DensShield and plastic off of the ceiling (weight of blown-in insulation above it would compromise plastic resulting in meltdown of homeowner), I've got to make sure to choose a membrane that prevents as much as possible water vapor from getting beyond the existing RedGard/DensShield ceiling. Last edited by SemiDriven; 12-10-2017 at 03:12 PM. So ripping out the tile is a better way to go then tiling over existing tile. I suppose the drain situation has a lot to do with going that route. Does HD rent hammer/chisel tool? I’ve got a small 4-inch grinder with a diamond disc. That should do the trick for the grinding. Just need to find a buffing pad. I will need a pro to help get the drain area properly prepared/set after I chisel the tile/concrete out. The stud framework rests right on the concrete floor. Waterproofing has to be done right which is why I’m thinking Schluter Systems. Well, two of the walls are off. I'm planning to keep using DensShield as it is easy to work with. I’m not sure I’d want to take the DensShield wall off where the shower head / handle is. On the other hand, I’m not sure what’s behind there. Hmmm….Could be another interesting surprise. I might have to take that one off as well. The ceiling is staying put because of the blown-in insulation above the plastic/DensShield. That’s why I’m thinking about putting Kurdi up on the ceiling. I have to prevent as much as possible any moisture vapor from entering that area. I wonder if anyone has had to put Kerdi over DensShield over plastic? Probably not! I’ve got a ways to go before I decide on whether to encompass the whole shower in Kurdi or just the ceiling/floor/seams. Peter, thanks for that advice!